‘. . . a refreshing antidote to the usual ‘classical music’ concert’. 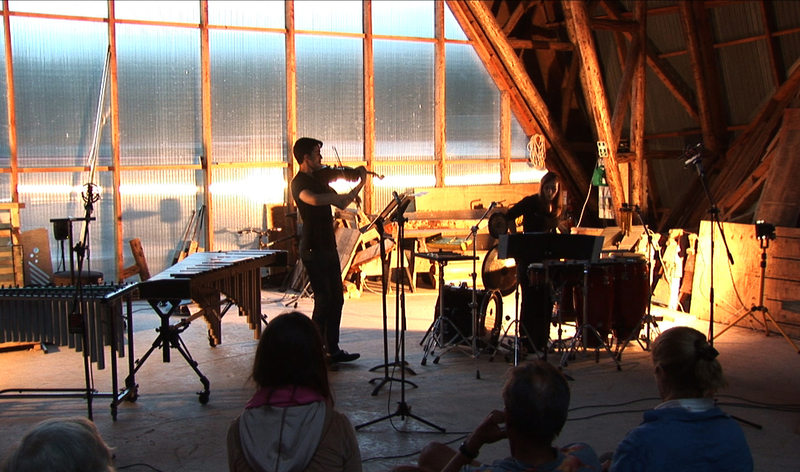 The first in our series of Contemporary Classical Music Concerts in West Dorset – Sonic Coast  – took place at the end of July. It was a beautiful summer evening and those who attended enjoyed classical music on their doorstep in a unique setting. Sonic Coast  will take place in The Hub, Lyme Regis on 30th August. Tickets booked in advance are just £5, with students and Under 16s free. DIVAContemporary’s opening concert in their ‘Sonic Coast’ contemporary music series proved to be a refreshing antidote to the usual ‘classical music’ concert. The series, curated by composer Marc Yeats, is bringing contemporary music to new audiences in Dorset and this first concert, given in the unusual venue of ‘The Big Shed’, Hooke Park Wood, featured Stephen Upshaw (viola) and Calie Hough (percussion). The well-balanced programme featured a mixture of contemporary classics and new pieces written especially for the occasion. American composer, Frederic Rzewski’s “To The Earth” for a kind of ‘flower-pot gamelan’ and speaker, was heard against the rhythmic counterpoint of the cooling wooden shed’s clicks and creaks; there was Benjamin Graves’ colourful and attractive exploration of folk melodies: ‘Perfect Straights’; Jay Cappernauld’s intense and muscular solo viola work ‘External: Internal’ (written especially for this opening concert); German composer, John Strieder’s ‘message’ – a meditative exploration of time and sonority and Darren Bloom’s virtuoso ‘tour-de-force’ ‘pull’ for percussion solo. The concert concluded with Marc Yeats’ “beyond this [all had been chaos]“ – a rich essay in extended techniques for viola in dialogue with a highly energized percussion part. The emotional heart of the concert was a powerful performance of Berio’s classic work for viola, percussion and tape ‘Naturale’. Using field recordings of Sicilian folksong, Berio uses the viola and percussion to punctuate, comment upon and transform the folk material. The piece has poignant political overtones as when the plangent viola music is shattered with the sounds of machine-gun fire, followed by an exody of tolling bells. The fearlessness of the performers and the quality of their performances kicked off the concert series in the best way possible. This entry was posted in associate artist, audio, David Rogers, ivon oates, Mandy Rathbone, Marc Yeats, Mark Hewitt, music, partnerships, radio, Ralph Hoyte, Victoria Pirie and tagged contemporary classical, new music. Bookmark the permalink. 1 Response to ‘. . . a refreshing antidote to the usual ‘classical music’ concert’.